I wish that I could say I had trained my kids from the get-go to clean up after themselves. I wish I could say they were born neat, or that I have successfully implemented a chore system (which I really should try to do soon). On the contrary, I have raised super messy kids. It feels like I can have a room all picked up, and then in a matter of minutes, everything will be everywhere once again. Like shoveling in a snowstorm, people say. It’s not just the toddler — the preschooler and first-grader are just as guilty. However, every once in a while, I will decide that I really need to get my kids to clean up. And I will muster up the energy and willpower to fight and win that battle. And boy, when I have done that, it is so rewarding to me — and I think it makes the kids feel good, too. If you have a similar battle to fight, here are some ideas to try that might just get your kids to clean up after themselves. Hopefully, after enough times being convinced to clean, they will start to naturally do it on their own! Assign the kids alternating cleaning shifts. Kids can be so easily distracted by one another. They can go from cleaning to arguing or monkeying around in the blink of an eye. During a recent cleaning session, I assigned my kids to five-minute shifts. One child went down to the playroom to clean while the other stayed upstairs with me. I set a timer for five minutes. They switched places when the timer went off, and we’d admire the other person’s work. Give the kids bite-sized cleaning projects. 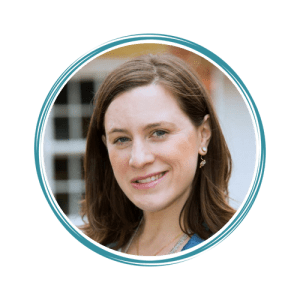 If your kids are overwhelmed by the size of the mess or how long it would take, help them break it down into bite-sized pieces. I’ve told my kids to use their “laser eyes” to locate a mess in the room, and once they see it, to pick it up. 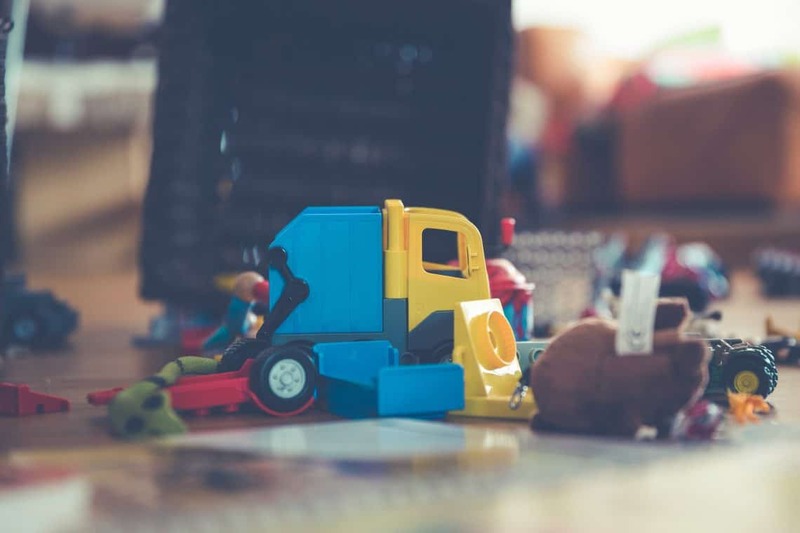 I think it also helps to give them categories of things to pick up — play food, figurines, blocks, and so on. Make cleaning activities into a ritual. Simple cleaning tasks can become habits when made into a ritual. Try teaching your kids to bring their dinner plates to the sink every night, pick up one toy before getting out the next, or put their shoes and coats away as soon as they get in the door. Turn cleaning into a fun activity. It shouldn’t come as a big surprise when kids are not excited to clean. It is not exactly the most fun use of their time — and kids are always looking for fun! What are some ways you could turn cleaning into a game? 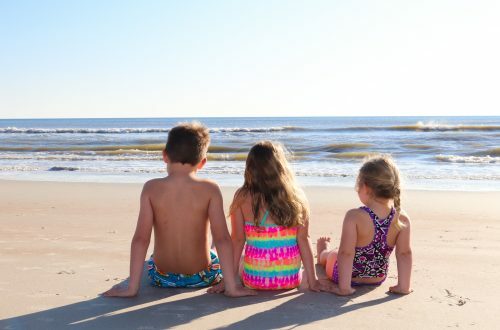 Try timing them to see how quickly they can accomplish certain tasks, creating a scavenger hunt for them to complete while they clean, or using music to lighten the mood. There are lots of great “cleanup songs” out there you could play for them, or make up your own! I still remember the tune my mom used to sing when we were going on a family cleaning spree. Teach the kids a new skill while you clean. Recently, when my kids were helping me clean up the living room, I got my son excited to learn how to fold a blanket. He likes to learn, and I think it was fun for him that it was something we were doing together. It also makes kids feel grown up when they learn how to do something new. Be on the lookout for jobs that your kids are getting old enough to do on their own. They might be excited to clean if you are consistently finding new jobs that they are “big enough” to do. Create a chart, checklist, or map for the kids to make the cleaning more of an interactive experience. Involve your kids in identifying the tasks that need to be incorporated into the plan. If your kids are old enough, you can ask them to help draw or write the finished product, and they can mark off their accomplishments along the way. Give the kids some perspective. Kids are often incredibly obedient and helpful outside of the home. Sometimes it helps to give the kids a little perspective. “Pretend I’m your teacher,” I might say, “and I just asked you to clean up your mess.” I think my kids are more responsive if we actually pretend I am their teacher and they show me how they would respond to their teacher instead of hashing out the hypothetical together. It might help to give the kids some agency in their cleaning. Ask them when they’d like to do the cleaning — before or after dinner. Ask them which tasks they’d prefer. Maybe one of your kids really gets a kick out of washing the floor while another likes to match socks. If they’re able to choose, and it’s something they actually would not mind doing, you might find you get less resistance. When all else fails, give them other helpful tasks. Should it prove too difficult to get the kids involved with the cleaning itself, find something else they can do that would facilitate your cleaning activities. For example, an older child might entertain a younger child for you. Younger kids might run and fetch cleaning supplies when asked. 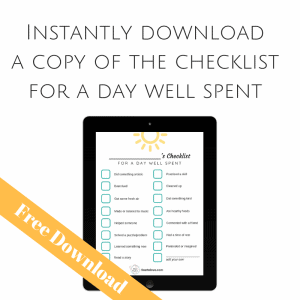 Cleaning up is one of the items on my printable checklist for a day well spent! 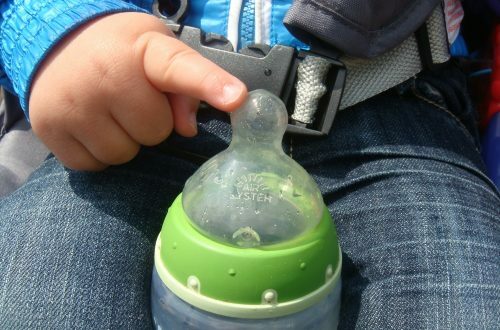 If you have a toddler at home, I wrote a whole post about getting toddlers to listen when you ask them to do something. You can read that here. 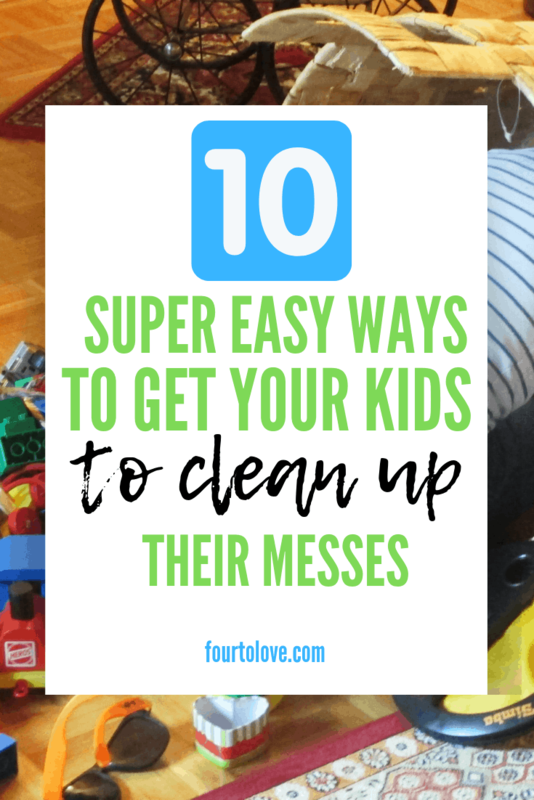 If you have other tried-and-true strategies for getting kids to clean up after themselves, leave them in the comments!